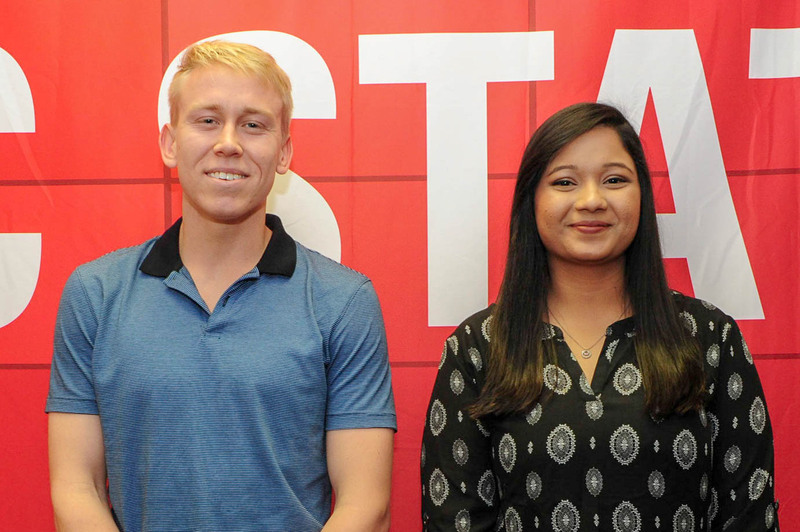 North Carolina State University today announced that Shanzila Chowdhury of Raleigh, NC and Artem Minin, of Cary, NC are recipients of the 2018 Sensus ReachSM Scholarship. Chowdhury is a senior and Minin a junior in the NC State College of Engineering and both have received a one-year stipend to cover tuition and fees, made possible by a donation from Raleigh, N.C.-based technology company, Sensus, a Xylem brand. Chowdhury is majoring in electrical engineering, plans to graduate in May 2019 and is currently seeking a full-time opportunity to combine her technical and interpersonal skills. Minin is majoring in both electrical engineering and computer engineering and plans to obtain his graduate degree through the department’s Accelerated Bachelors/Master’s (ABM) program following the completion of his undergraduate degrees in May 2020. Both Chowdhury and Minin say that receiving the Sensus ReachSM Scholarship has removed a financial burden and allowed them to focus on their studies, student activities and community service as they work toward graduation. Sensus, provides technologies that help utilities and other public service providers improve the quality of life in their communities. The company established the scholarship in 2016 with a $100,000 donation to the Department of Electrical and Computer Engineering. The scholarship is a merit and need based award given to two promising students annually. The program is open to rising juniors or seniors majoring in electrical and/or computer engineering. Students residing in Wake, Chatham, Harnett, Johnston, Nash, Franklin, Granville, Durham and Orange counties are eligible to apply. “We appreciate our ongoing partnership with Sensus. The real winners will be the student scholars, and we are grateful to Sensus for providing this opportunity to our deserving students,” commented Dr. Daniel Stancil, Alcoa Professor and head of the Department of Electrical and Computer Engineering. Interested students can apply by on the Engineering Scholarships page.